A key requirement of Shropshire Council's Local Sustainable Transport Fund award, is to raise awareness of alternative transport and to ensure that people have access to the information they need to make informed travel choices. The Shropshire package was built around a number of successful innovative transport projects Including Cycle Shrewsbury and the Shropshire Link demand responsive service. The package supports the economy by reducing traffic congestion in the focus towns of Shrewsbury, Oswestry and Ludlow facilitating significant housing and employment growth, supporting sustainable tourism and improving access to local shops, services and work from rural surrounding areas. The package reduces carbon emissions and tackles air pollution through better traffic flow and modal shift towards cycling, walking, public transport, and park and ride as well as promoting tele working and more efficient vehicle use. Keeping the same look and feel of the mapping across both printed and online products aids users through familiarity and maintains Shropshire's sustainable travel brand. Based upon a proven mapping framework developed by Pindar Creative, the website will be device independent allowing access via browsers, tablets and smartphones. The development of a widget system allows Shropshire the flexibility they require to offer users many additional functionality features such as keys, scale, search, journey planning and additional useful links. The mapping has been developed to incorporate multiple cartographic levels and will allow the user to zoom and pan functionality. A full screen mode is also an available option to users. The largest scale level shows detailed bus stop and transport interchange information. 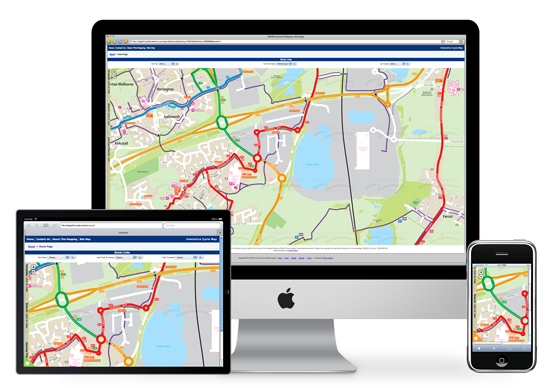 The search functionality includes the facility to find area/place name, road names, bus stop name/asset number, timetables, place of interest or landmarks and postcodes. The site allows users to view places of interest for travel destinations and timetables, or highlight their specific individual routes. The maps are layered in such a way that within the bus map layer users can view the timetables of bus services and plan journeys using the map to select the starting point and destination. The website will also enable Shropshire Council to produce additional ad hoc sustainable travel publicity and mapping products in a variety of different formats and style, providing consistency in the information displayed. ACTO CIF data is imported weekly into the timetable search system, which not only allows full timetables to be displayed, but also specific bus stops with locational and service data. "Working with Shropshire has allowed us to push the boundaries on our interactive mapping product. This site now contains over 120,000 elements within the mapping section alone, and has been adapted to allow us to deliver the content as fast as possible. The ability to work with ACTO CIF data allows Shropshire to display the timetable data as HTML, rather than the traditional PDF files giving even more flexibility. In this age of mobile Internet, ‘responsive design' has been key to enable the delivery of the content to phones and tablets in a user-friendly format." "Pindar has enabled Shropshire Council to realise our vision for detailed comprehensive mapping and transport information online. With their guidance and support we have successfully met our goals and now have a bespoke website which is available to residents, tourists and passengers wishing to travel in Shropshire."